Cousin Danny Cohen spotted this story on the AP wires and remembered Fat Al’s love for PBR. I love everything about this story but the way Bill Bramanti’s daughter refers to him as “Bill Bramanti” is the best. 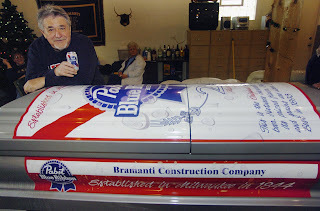 SOUTH CHICAGO HEIGHTS, Ill. (AP) — Bill Bramanti will love Pabst Blue Ribbon eternally, and he’s got the custom-made beer-can casket to prove it. “I actually fit, because I got in here,” said Bramanti of South Chicago Heights. The 67-year-old Glenwood village administrator doesn’t plan on needing it anytime soon, though. 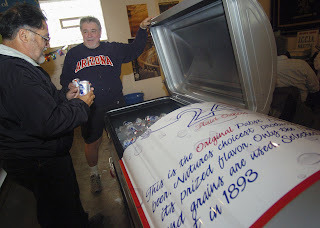 He threw a party Saturday for friends and filled his silver coffin — designed in Pabst’s colors of red, white and blue — with ice and his favorite brew. “Why put such a great novelty piece up on a shelf in storage when you could use it only the way Bill Bramanti would use it?” said Bramanti’s daughter, Cathy Bramanti, 42.